the 100 µm scale bar applies to figs. 1, 3, 5, 6, 7 and 9a. Fig. 9b has its own scale bar. Fig. 1. Stylosphaera hispida. BSS 30B(F) EF N46. Figs. 2, 7, 8. Hexacontium melpomene. Note linked differences in main and by-spine length and bar thickness of figs. 2 and 8. Also note third 'main' spine in fig. 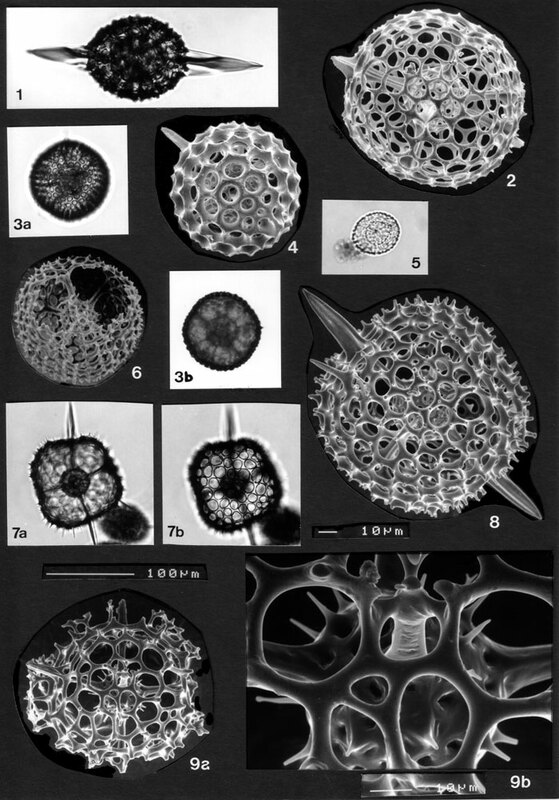 8 (upper left) and dents, similar to those of H. inerme, where main beams connect with the macrospheric shell wall. Fig. 7a: focus on medullary shells; fig. 7b: focus on cortical shell. BSS 28B(VII/1379), 61B(F) EF C38 and 28B(VIII/1024). Figs. 3, 6. Hexacontium inerme Figs. 3a and b: focus on cortical and medullary shells resp. BSS 27B(F) EF T32 and 28B(II). Fig. 4. Unidentified thecosphaerid, with two polar spines (the one at lower right broken off near its base. BSS 28B(VII/1379). Fig. 5. Stylosphaera pyriformis. BSS 19B(F) EF V43. Fig. 9a,b. Hexacontium heracliti. BSS 28B(VI/488).